MicroRNAs have been implicated in ischemic AKI. However, the specific microRNA species that regulates ischemic kidney injury remains unidentified. Our previous microarray analysis revealed microRNA-489 induction in kidneys of mice subjected to renal ischemia-reperfusion. In this study, we verified the induction of microRNA-489 during ischemic AKI in mice and further examined the underlying mechanisms. 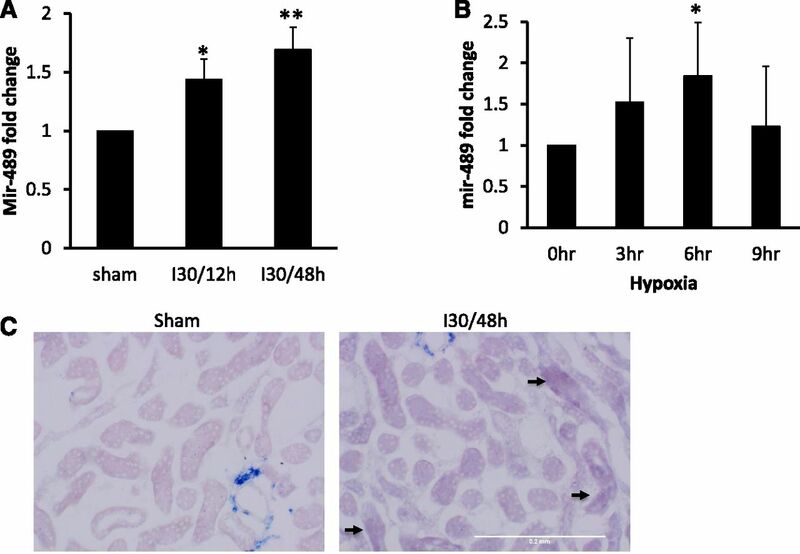 Hypoxia–inducible factor–1α deficiency associated with diminished microRNA-489 induction in cultured rat proximal tubular cells subjected to hypoxia and kidney tissues of mice after renal ischemia-reperfusion injury. Moreover, genomic analysis revealed that microRNA-489 is intronic in the calcitonin receptor gene, and chromatin immunoprecipitation assays showed increased binding of hypoxia–inducible factor–1 to a specific site in the calcitonin receptor gene promoter after hypoxia. 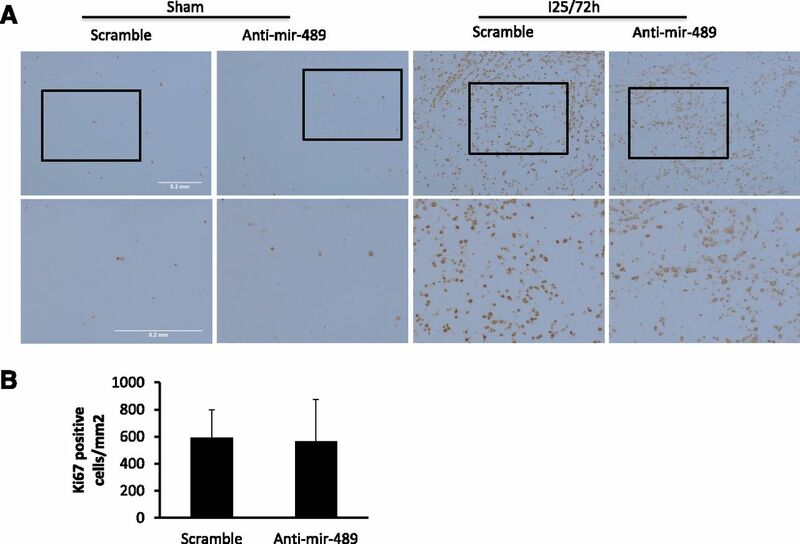 Inhibition of microRNA-489 increased apoptosis in renal tubular cells after ATP depletion injury in vitro, whereas microRNA-489 mimics mediated protection. In mice, inhibition of microRNA-489 enhanced tubular cell death and ischemic AKI without significantly affecting tubular cell proliferation. Deep sequencing identified 417 mRNAs that were recruited to the RNA–induced silencing complex by microRNA-489. Of the identified mRNAs, 127 contain microRNA-489 targeting sites, and of those, 18 are involved in the cellular stress response, including the poly(ADP-ribose) polymerase 1 gene implicated in ischemic kidney injury. Sequence analysis and in vitro studies validated poly(ADP-ribose) polymerase 1 as a microRNA-489 target. Together, these results suggest that microRNA-489 is induced via hypoxia–inducible factor–1 during ischemic AKI to protect kidneys by targeting relevant genes. miR-489 is an miR that has been reported to act as a tumor suppressor and play roles in muscle stem cell quiescence and cardiac hypertrophy. It is also upregulated in clear cell papillary renal cell carcinoma.27–30 In ischemic AKI, our miR profiling suggested miR-489 induction in kidney tissues after renal ischemia-reperfusion.21 However, the mechanism of miR-489 induction in these disease conditions was unclear, and the role of miR-489 in ischemic AKI was unknown. In this study, we show that miR-489 is induced via hypoxia–inducible factor–1 (HIF-1) during hypoxia of tubular cells in vitro and ischemic AKI in mice. We further show a renoprotective role of miR-489 under these conditions. Deep RNA sequencing (RNA-seq) has further identified multiple target genes of miR-489 that may be responsible for its protective effect. Our microarray analysis identified miR-489 as one of the miRs that was significantly induced in kidney tissues after 30 minutes of renal ischemia and 12–48 hours of reperfusion in mice.21 To further confirm this induction, we measured miR-489 by quantitative real–time PCR (Figure 1). Compared with sham-operated control, miR-489 increased 1.44±0.17-fold (n=3; P<0.05) and 1.69±0.19-fold (n=6; P<0.01) in kidney cortex and outer medulla after 30 minutes of ischemia and 12 or 48 hours of reperfusion, respectively (Figure 1A). Interestingly, miR-489 induction was also detected during hypoxic incubation of cultured rat proximal tubular cells (RPTCs). As shown in Figure 1B, hypoxia (1% O2) induced miR-489 time dependently, reaching 1.84±0.65-fold (n=5; P<0.05) at 6 hours and then decreasing toward the basal level (Figure 1B). The in vitro data suggest that miR-489 is likely to be induced in renal tubules by hypoxia in ischemic AKI. To localize miR-489 induction in kidneys after ischemia-reperfusion injury, we conducted in situ hybridization (Figure 1C). Low levels of miR-489 were detected in most renal tubules in control kidneys. After 30 minutes of ischemia and 48 hours of reperfusion, there was an overall increase of miR-489 in renal tubules, and the increase was more in injured tubules mainly in the outer stripe of outer medulla (arrows in Figure 1C). Interestingly, we also detected some strong interstitial signals that appeared in blue, but the interstitial staining did not change significantly after ischemic injury. It was suggested that miR-489 was mainly induced in renal tubular cells. miR-489 is induced in ischemic AKI and hypoxic renal tubular cells. (A) C57BL/6 mice were subjected to 30 minutes of bilateral renal ischemia with 12 or 48 hours of reperfusion or sham operation. miR-489 in the kidney cortex and outer medulla was detected by real-time PCR. (B) RPTCs were treated with 1% oxygen, and miR-489 level was examined by quantitative real–time PCR (n=3–6). *P<0.05 compared with sham operation or no hypoxia controls; **P<0.01 compared with sham. (C) C57BL/6 mice were subjected to 30 minutes of bilateral ischemia with 48 hours of reperfusion or sham operation. miR-489 in the kidney was detected by in situ hybridization. The arrows show the significant induction of miR-489 in injured tubules. Scale bar, 0.2 mm. Because we observed miR-489 induction by hypoxia in RPTCs, we hypothesized that miR-489 induction during renal cell hypoxia and ischemic AKI may involve HIF-1, the master regulator of gene expression in hypoxia.31 HIF-1 consists of α- and β-subunits. Although HIF-1β is constitutively expressed, HIF-1α is induced by hypoxia and forms a heterodimer with HIF-1β to translocate to the nucleus to induce hypoxic gene expression. Accordingly, HIF-1α induction is a good indication of HIF-1 activation. In our study, HIF-1α was induced during hypoxic incubation of RPTCs, starting from 3 hours and lasting until 9 hours (Figure 2A). In line with previous work,32–34 HIF-1α was also induced in kidney tissues during renal ischemia-reperfusion in our study (Figure 2B). HIF-1 contributes to miR-489 induction in ischemic AKI and hypoxic incubation. (A) The Western blot of HIF-1α in RPTC whole–cell lysate with 1% oxygen treatment. Cyclophilin B was used as the internal loading control. (B) C57BL/6 mice were subjected to 30 minutes of bilateral renal ischemia with 12 or 48 hours of reperfusion or sham operation. The HIF-1α level was detected by Western blot, and β-actin was used as the internal loading control. (C) HEK293 stable cells with scramble shRNA or HIF-1α inhibition shRNA-A or -B were treated with 1% oxygen for 6 hours. The HIF-1α level was examined by Western blot with β-actin as the internal loading control. (D) PT-HIF-1 wild-type (WT) or PT-HIF-1 knockout (KO) mice were subjected to 30 minutes of bilateral renal ischemia and 12 hours of reperfusion or sham operation. The HIF-1α level was detected by immunohistochemical staining, and the renal tubules with HIF-1α were shown by arrows. (E) HEK293 stable cells with scramble shRNA or HIF-1α inhibition shRNA-A or -B were treated with 1% oxygen for 6 hours. miR-489 level was detected by real-time PCR. *P<0.05 compared with the scramble group. (F) PT-HIF-1 WT or PT-HIF-1 KO mice were subjected to 30 minutes of bilateral renal ischemia and 48 hours of reperfusion or sham operation. miR-489 level in the cortical and outer medulla total RNA was detected by real-time PCR (n=3–5). *P<0.05 compared with sham group. To determine the role of HIF-1 in miR-489 induction during renal hypoxia and ischemia-reperfusion, we initially established stable human embryonic kidney (HEK293) cell lines with HIF-1α knockdown by two different shRNAs (shRNA-A and shRNA-B). 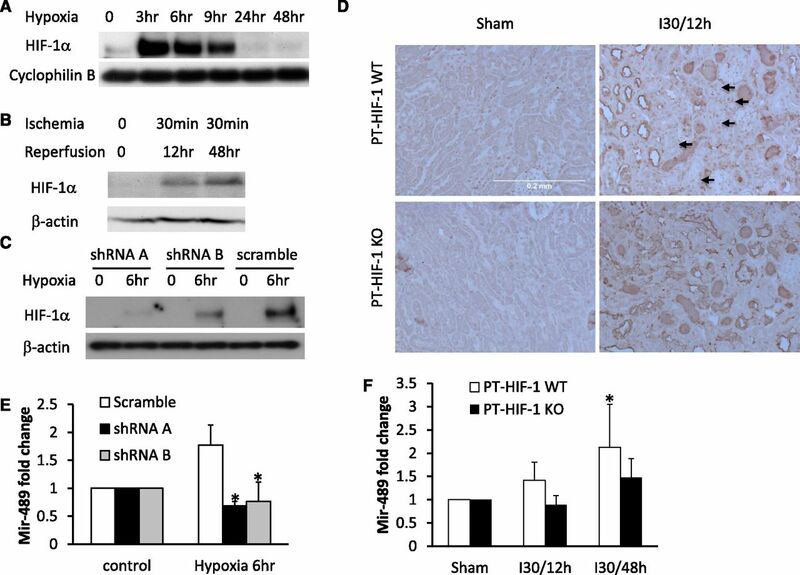 Compared with scrambled sequence–transfected cells, HIF-1 inhibitory shRNA–transfected cells showed a lower HIF-1α induction during hypoxic incubation (Figure 2C). Importantly, 6 hours of hypoxia induced a 1.77±0.36-fold increase of miR-489 in the scrambled cells, which was completely blocked in siHIF-1–transfected cells (Figure 2E). We further examined the HIF-1 dependence of miR-489 induction in vivo. To this end, we generated renal proximal tubule–specific HIF-1α [PT-HIF-1(−/−)] knockout mice by crossing floxed HIF-1α mice with PEPCK-CRE transgenic mice. PT-HIF-1(−/−) and PT-HIF-1(+/+) mice showed similar renal ischemia-reperfusion injury (Supplemental Figure 1). Immunohistochemical staining showed the induction of HIF-1α in the nuclei of many renal tubular cells in PT-HIF-1(+/+) kidneys, and this inductive response was suppressed in PT-HIF-1 knockout mice, verifying HIF-1α deletion in kidney tubules in these animals (Figure 2D). Importantly, renal ischemia-reperfusion induced miR-489 time dependently in wild-type mice, which was partially suppressed in PT-HIF-1 knockout mice (Figure 2F). Together, these in vivo and in vitro data indicate that miR-489 is induced via HIF-1 during renal hypoxia and ischemia-reperfusion. In the genome, the miR-489 gene is localized at the intronic region of the calcinotin receptor (calcr) gene, suggesting that miR-489 may be an intronic miR of calcr. Using the JASPAR database (http://jaspar.genereg.net), we analyzed the promoter of calcr and the genomic region immediately upstream of the miR-489 sequence. The analysis identified three putative HIF-1 binding sites: one located immediately upstream of the miR-489 gene and two in the promoter of calcr (Figure 3A). Experimentally, we examined the binding of HIF-1α to these sites by CHIP assay. After hypoxia, significantly more DNA fragments from calcr site 1 were pulled down by anti–HIF-1α (Figure 3B), suggesting that HIF may directly bind to calcr site 1 to regulate miR-489 transcription. HIF-1 binds to Calcr/miR-489 gene promoter. 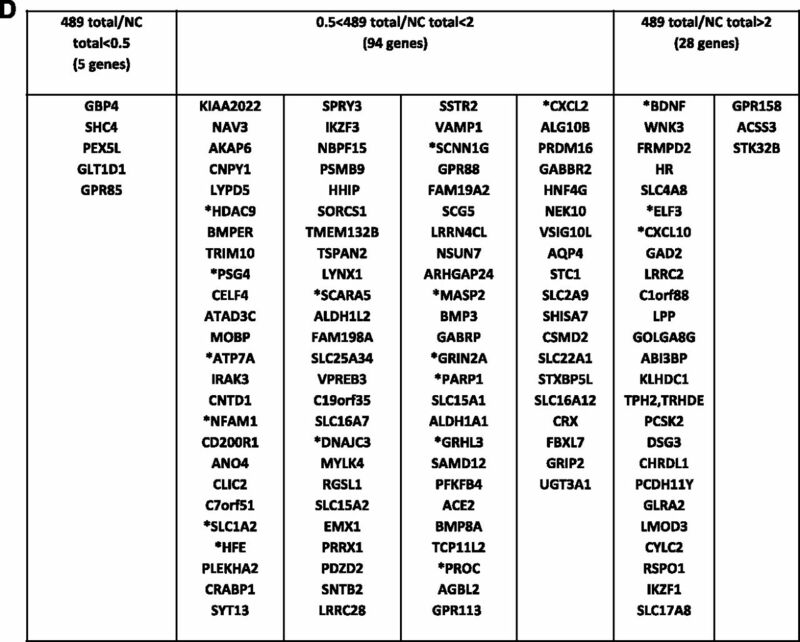 (A) Predicted HIF-1 binding sites in mouse miR-489 and calcr gene promoter regions. mmu-miR-489 (miR-489) and mouse calcr gene upstream regions were analyzed for HIF-1 binding sites by JASPAR online analysis (http://jaspar.genereg.net). The potential binding sites of >90% chance (relative score) to bind HIF-1 are listed. (B) The induction of HIF-1 binding to its binding sites after hypoxia. BUMPT cells were treated with 1% oxygen for 6 hours. The chromatin samples were sonicated and immunoprecipitated with anti–HIF-1α antibody. The induced HIF-1 binding to the specific sites by hypoxia compared with normoxia was examined by real-time PCR to detect the DNA fragments containing the binding sites (n=3–4). H/N, the ratio of HIF-1 binding under hypoxia over HIF-1 binding under normoxia. *P<0.05 comparing HIF-1 binding efficiency with the specific site after hypoxia and normoxia treatment. To examine the role of miR-489 in kidney injury, we initially tested the in vitro model of ATP depletion, which recapitulates some of the key features of renal ischemia-reperfusion (sometimes called chemical hypoxia/ischemia). To inhibit miR-489, we transfected RPTCs with anti–miR-489, a locked nucleic acid (LNA) oligonucleotide that is specifically against miR-489. 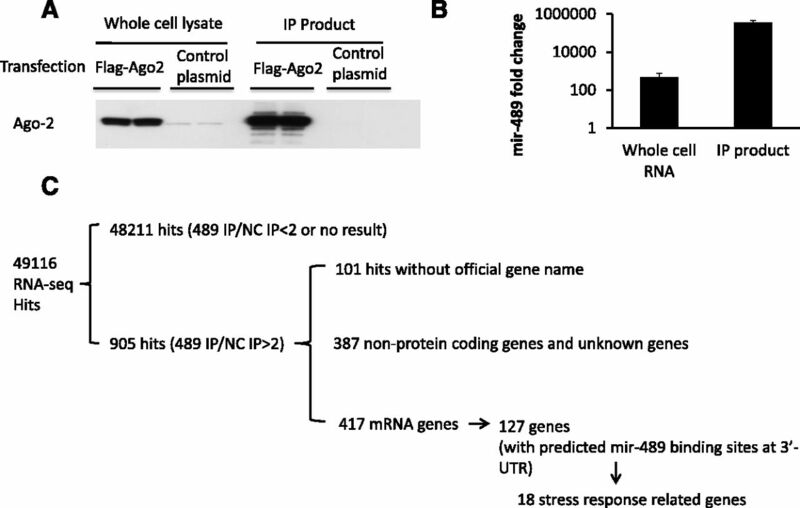 The transfection of anti–miR-489 or scrambled sequence did not induce noticeable injury difference in RPTCs under control conditions as shown by low levels of apoptosis and caspase activity (Figure 4). ATP depletion induced 21%±3% apoptosis in scrambled sequence transfected cells, which was increased to 43%±5% by anti–miR-489 (Figure 4, A and B). Consistently, caspase activation after ATP depletion was also markedly increased by anti–miR-489 (Figure 4C). The injury-enhancing effect of anti–miR-489 suggests that miR-489 may play a protective role in renal tubular cells. 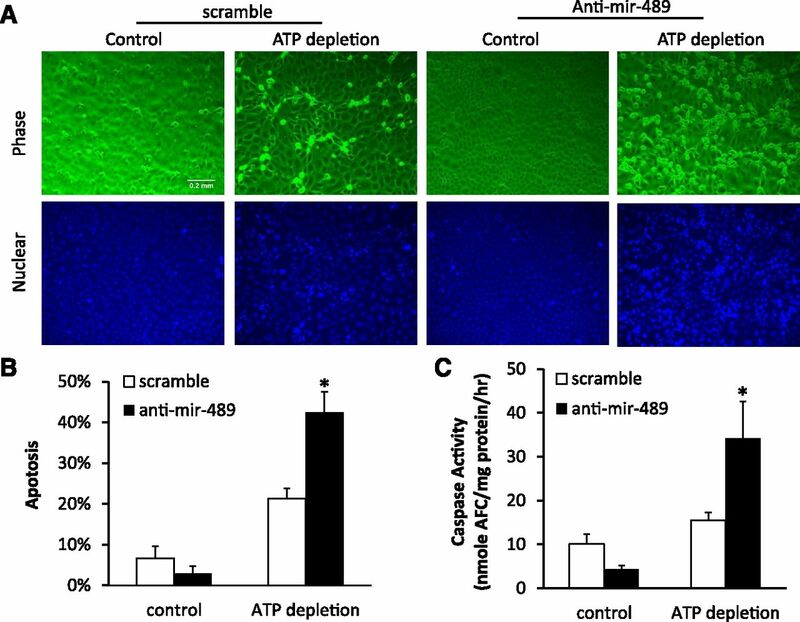 Anti–miR-489 increases renal tubular cell apoptosis after ATP depletion. RPTCs were transfected with 200 nM scramble LNA or anti–miR-489 LNA followed by ATP depletion and recovery. (A) The morphology of cells and nuclear. Scale bar, 0.2 mm. (B) The apoptosis percentage by morphology estimation. (C) The caspase activity (n=3–4). AFC, 7-amino-4-trifluoromethyl coumarin. *P<0.05 compared with the scramble group. We further tested the effect of miR-489 mimics in RPTCs. The cells in control conditions did not show obvious apoptosis with very low levels of caspase activity. After ATP depletion, the cells with negative control mimics had 42%±8% apoptosis, whereas those transfected with miR-489 mimics had 22%±7% apoptosis (Figure 5, A and B). Consistently, miR-489 mimics significantly reduced caspase activity (Figure 5C). 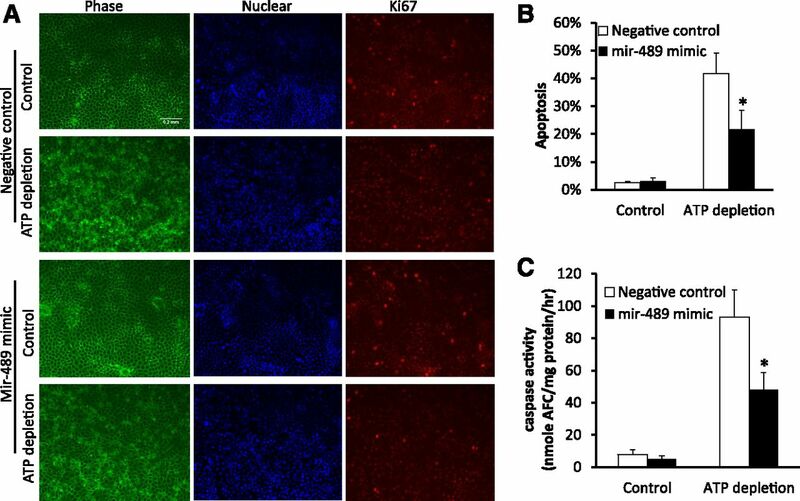 miR-489 was reported to maintain the quiescent status of muscle stem cells.27 However, in RPTCs, miR-489 did not significantly attenuate cell proliferation as shown by Ki67 staining (Figure 5A), suggesting that miR-489 is not critical to the proliferation or quiescence in renal tubular cells. miR-489 mimic decreases tubular cell apoptosis after ATP depletion without changing cell proliferation. RPTCs were transfected with 200 nM negative control or miR-489 mimics and then subjected to ATP depletion and recovery. (A) The cell morphology, nuclear, and Ki67 staining. Scale bar, 0.2 mm. (B) The percentage of apoptosis. (C) Caspase activity (n=4–6). AFC, 7-amino-4-trifluoromethyl coumarin. *P<0.05 compared with the negative control group. 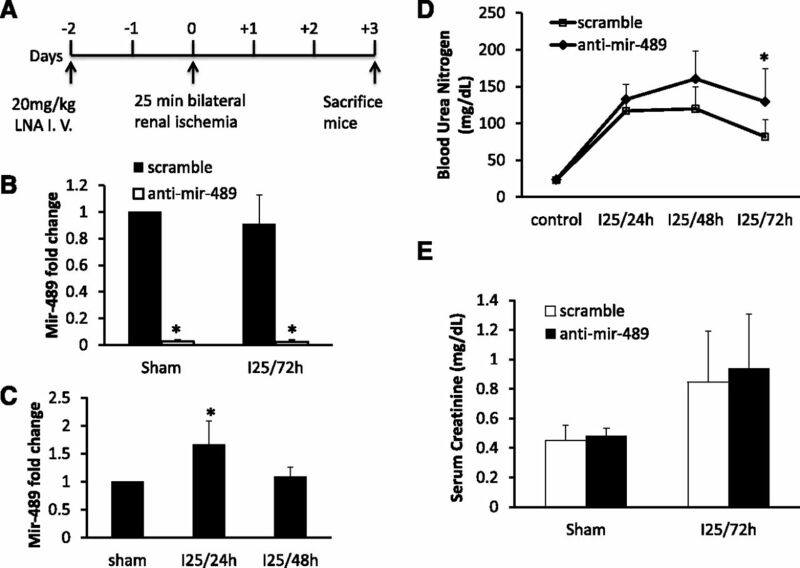 To determine the role of miR-489 in ischemic AKI in vivo, mice were injected with anti–miR-489 and then subjected to 25 minutes of bilateral renal ischemia with reperfusion (Figure 6A). We first verified the inhibition of miR-489 in kidney tissues by anti–miR-489. As shown in Figure 6B, real–time PCR analysis showed that miR-489 in kidney cortex and outer medulla was reduced to <5% compared with scrambled sequence–injected mice (Figure 6B). In this 25-minute ischemia model, significant miR-489 induction was detected after 24 hours of reperfusion (Figure 6C). We then monitored renal function of the mice after ischemic AKI daily by measuring BUN. Compared with scrambled oligo–injected mice, anti–miR-489–treated mice consistently showed a higher BUN after renal ischemia (Figure 6D). Anti–miR-489–treated mice also showed marginally higher serum creatinine at 72 hours of reperfusion (Figure 6E). Anti–miR-489 worsens renal function in ischemic AKI. C57BL/6 male mice were treated with 20 mg/kg scramble or anti–miR-489 LNA and subjected to 25 minutes of bilateral kidney ischemia. (A) Schematics showing the timeline of LNA administration and kidney ischemia injury. I.V., intravenous. (B) Real-time PCR of the miR-489 level in mouse kidney cortex and outer medulla. (C) Real-time PCR of the miR-489 level in mouse kidneys cortex and outer medulla without LNA treatment at 24 and 48 hours of reperfusion. (D) The BUN of the mice at different reperfusion times. (E) Serum creatinine at 72 hours of reperfusion (n=3–7). *P<0.05 comparing the scramble group with the anti–miR-489 group. We further examined the effect of anti–miR-489 on kidney tissue injury. Kidney tissue sections was stained by hematoxylin and eosin and terminal deoxynucleotidyl transferase–mediated digoxigenin-deoxyuridine nick–end labeling assay to reveal the tissue damage and apoptosis, respectively. As expected, sham–operated control kidneys showed a healthy histology without tubular damage or apoptosis (Figure 7, A and C). Twenty-five minutes of renal ischemia with 72 hours of reperfusion induced a moderate renal tubular damage in scrambled oligo–treated mice as shown by dilation, loss of brush boarder, and necrosis as well as apoptosis in some renal tubules (Figure 7, A and C). In contrast, much more severe AKI was induced by renal ischemia-reperfusion in anti–miR-489–injected mice. In the kidneys of these animals, 22% of renal tubules showed the signs of injury or damage (Figure 7B). Moreover, these tissues showed significantly more apoptotic cells (73/mm2) than the scrambled oligo group (39/mm2) (Figure 7D). 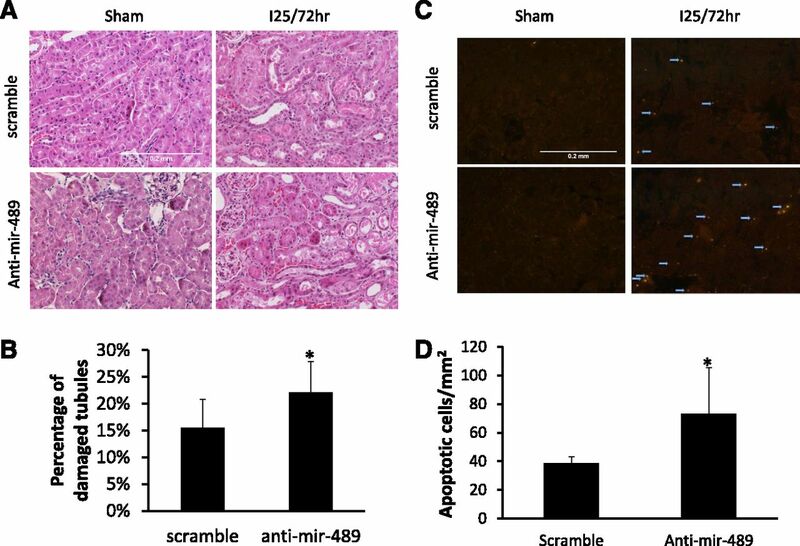 Anti–miR-489 increases kidney tubular damage and apoptosis in ischemic AKI. C57BL/6 mice were treated with scramble LNA or anti–miR-489 LNA followed by 25 minutes of bilateral renal ischemia and 72 hours of reperfusion. (A) The representative hematoxylin and eosin images of kidneys. (B) The injured tubular percentage after 25 minutes of ischemia and 72 hours of reperfusion. (C) The representative terminal deoxynucleotidyl transferase–mediated digoxigenin-deoxyuridine nick–end labeling (TUNEL) images of kidneys. (D) The apoptotic tubular cell numbers in kidneys from TUNEL images (n=4–6). Scale bar, 0.2 mm. *P<0.05 compared with the scramble group. In our study, the maximal BUN was detected at 24–48 hours of reperfusion after 25 minutes of bilateral renal ischemia. By 72 hours of reperfusion, BUN started to decrease (Figure 6D), suggesting renal recovery as a result of kidney repair. Anti–miR-489 had notable effects on BUN and renal histopathology at 72 hours of reperfusion (Figures 6D and 7), suggesting that anti–miR-489 may adversely affect kidney repair. Tubular cell proliferation and resultant tubular repair are key processes in kidney recovery after AKI.5 Thus, we examined tubular cell proliferation by Ki67 staining.35 As expected, sham–operated control kidneys only showed a few Ki67-positive cells, whereas significant amounts of Ki67-positive cells were induced by 25 minutes of ischemia with 72 hours of reperfusion (Figure 8A). Of note, cell counting indicated that anti–miR-489 did not affect cell proliferation (Figure 8B). These results suggest that, in ischemic AKI, miR-489 mainly contributes to kidney protection and does not contribute to kidney repair. Anti–miR-489 does not affect tubular proliferation after ischemic AKI. C57BL/6 mice were treated with scramble LNA or anti–miR-489 LNA followed by 25 minutes of bilateral renal ischemia and 72 hours of reperfusion. (A) Representative images of immunohistochemistry of Ki67. Lower panels are the magnified images of the boxed areas from upper panels. Scale bar, 0.2 mm. (B) The Ki67–positive cell numbers in kidneys with 25 minutes of ischemia and 72 hours of reperfusion (n=4). In cells, an miR represses target gene expression via the microRNA–induced silencing complex (miRISC). Argonaute (Ago) proteins are the key components of miRISC, where an miR and its target gene mRNAs associate. Therefore, to identify the targets of miR-489, we analyzed the mRNAs that were associated with miRISC in the presence or absence of miR-489 by deep RNA-seq. Specifically, FLAG-tagged Ago-2 and miR-489 mimics (or negative control RNA oligos) were cotransfected into HEK cells to collect lysate for immunoprecipitation (IP) with an anti-FLAG antibody. Successful IP of FLAG-Ago-2 was verified by immunoblotting (Figure 9A). Moreover, real–time PCR analysis showed that miR-489 transfection led to a 483-fold increase of miR-489 in transfected cells, which was drastically increased to 359,129-fold in FLAG-Ago-2 immunoprecipitate (Figure 9B). This marked accumulation of miR-489 in FLAG-Ago-2 immunoprecipitate was consistent with miR association in miRISC. Identification of miR-489 targets by Ago-2 IP and RNA-seq. (A) HEK293 cells were transfected with Flag-Ago-2 expression plasmid or control plasmid. The lysates were subjected to IP with anti-Flag antibody. Western blot of Ago-2 was performed to verify the successful IP of Ago-2. (B–D) HEK293 cells were cotransfected with Flag-Ago-2 and miR-489 RNA mimic (489) or negative control RNA oligos (NC). The lysates were subjected to IP with anti-Flag. The total RNA directly from cells or the RNAs in the IP products were extracted for RNA-seq. (B) Real-time PCR to show the enrichment of miR-489 in the IP products. The miR-489 levels were compared between the 489 group and the NC group (n=3). (C) Diagram showing the different types of genes identified by RNA-seq. (D) List of the 127 genes as miR-489 targets. These coding genes were recruited to Ago-2 RISC by miR-489 and contained predicted miR-489 target sequence in their 3′-UTR. The genes are categorized in the table according to the ratio between their mRNA levels in the presence of miR-489 or the negative control oligo. *Eighteen genes related to stress response. We then analyzed the total RNAs and the RNAs in FLAG-Ago-2 immunoprecipitate by RNA-seq. The analysis detected 49,116 hits, of which 905 showed significant (over twofold) increases in FLAG-Ago-2 immunoprecipitate after miR-489 expression. In these 905 hits, 417 were for protein-coding genes, whereas 387 were for noncoding genes, and 101 hits were for un-named genes (Figure 9C, Supplemental Tables 1 and 2). We further analyzed the 3′-untranslated regions (3′-UTRs) of the 417 coding genes and found that 127 of them contained miR-489–targeting seed sequence. Functional classification using The Database for Annotation, Visualization and Integrated Discovery indicated that these 127 genes may participate in the regulation of several cellular processes or activities (Supplemental Table 3). Especially, 18 of the identified genes were shown to be cellular stress response related (Figure 9D). Together, the results suggest that miR-489 may regulate kidney injury by targeting multiple genes, including many involved in stress response. Among the 18 stress-responsive genes, PARP1 is a known cell death mediator that is activated during ischemic AKI to contribute to renal tubular cell death and tissue damage.36 Thus, we examined PARP1 regulation by miR-489 to verify the RNA–induced silencing complex (RISC) IP/RNA-seq results. By sequence analysis with Segal Lab of Computational Biology online software, we identified a potential miR-489 binding site in the 3′-UTR of mouse PARP1 gene (Figure 10A). When inserted into a luciferase reporter plasmid, this 3′-UTR sequence suppressed luciferase expression in the presence of miR-489 (Figure 10B). Furthermore, miR-489 suppressed, whereas anti–miR-489 induced PARP1 protein expression in RPTCs with or without ATP depletion injury (Figure 10C). 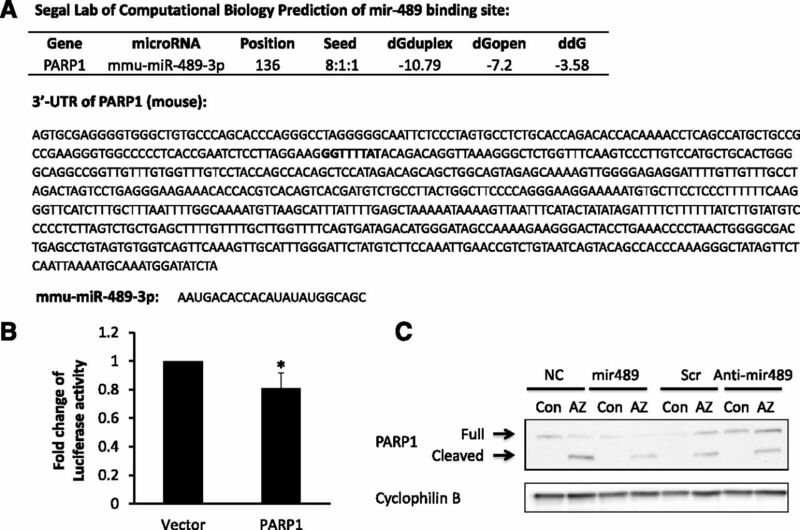 Together, the results suggest that PARP1 may be a direct target of miR-489. Confirmation of PARP1 as an miR-489 target. (A) Prediction of mmu-miR-489 binding site in the 3′-UTR of PARP1. The potential binding site (bold) was predicted by the Segal Lab of Computational Biology with the input of the indicated 3′-UTR of mouse PARP1 and mmu-miR-489–3p sequences. (B) Target reporter luciferase assay. HEK293 cells were cotransfected with miR mimics and the pMIR-REPORT miRNA Expression Reporter Vector with or without the insert of mouse PARP1 3′-UTR. The luciferase activity ratios (mmu-miR-489 mimic-to-negative control mimic ratios) were calculated to indicate the fold change, and the ratio with empty vector cotransfection was used for normalization (n=4). *Statistically significant difference comparing the mmu-miR-489 group with the negative control group. (C) Effects of miR-489 and anti–miR-489 on PARP1 expression. RPTCs were transfected with 200 nM miR-489 mimic, LNA, or control sequences and then subjected to ATP depletion and recovery. Full shows the full-length band of PARP1, and cleaved shows the cleaved band of PARP1. Cyclophilin B was used as the loading control. AZ, ATP depletion with 10 mM azide treatment; Con, control conditions without ATP depletion; ddG, the difference between dGduplex and dGopen; dGduplex, the energy score to form duplex between a miRNA and its target; dGopen, the energy score without duplex forming; NC, negative control miR; Scr, scramble LNA. By microarray analysis, we identified 13 miRs that were significantly upregulated in kidney tissues during bilateral renal ischemia-reperfusion.21 In that analysis, miR-489 showed a greater than fourfold induction in kidney cortex and outer medulla. Our study has further validated miR-489 induction in ischemic AKI by quantitative real–time PCR and in situ hybridization (Figure 1, A and C). miR-489 induction shown by real-time PCR is not as high as that shown by previous microarray analysis. The discrepancy between these two analyses, according to past experience, was mainly caused by the use of different normalization criteria. Specifically, global normalization of snoRNA202, snoRNA135, and U87 was used for normalization in the microarray analysis, whereas only snoRNA202 was used in our real–time PCR quantification. Nonetheless, these analyses showed miR-489 induction mainly in renal tubular cells after ischemic AKI. Mechanistically, we showed evidence for the involvement of HIF-1 in miR-489 induction during renal tubular cell hypoxia in vitro and renal ischemia-reperfusion in vivo (Figure 2). First, HIF-1 activation and miR-489 induction showed a good temporal correlation in both in vivo and in vitro models. Second, miR-489 induction during hypoxia was attenuated in HIF-1α knockdown cells. Third, compared with wild-type littermates, PT-HIF-1α knockout mice showed lower miR-489 induction during renal ischemia-reperfusion. It is noteworthy that the suppression of miR-489 induction in PT-HIF-1α knockout kidneys was not complete. At least two features of the model contributed to the incomplete effect. It is known that PEPCK-Cre leads to a significant (70%–80%) but incomplete gene deletion in kidney proximal tubules.37 Consistently, immunostaining showed that HIF-1α was deleted from the majority (approximately 80%) but not all of the proximal tubules in our PT-HIF-1α knockout mice (Figure 2D). In addition, in this model, HIF-1α was specifically ablated from proximal tubular cells and not ablated from other kidney cells, such as the cells of glomeruli and distal tubules. The proximal tubular cells and other cell types in kidneys that were not ablated of HIF-1α could maintain a partial miR-489 induction in PT-HIF-1α knockout mice during renal ischemia-reperfusion. Our CHIP assay (Figure 3) further provides the evidence for direct binding of HIF-1 to one of the putative sites in the Calcr/miR-489 gene promoter region. 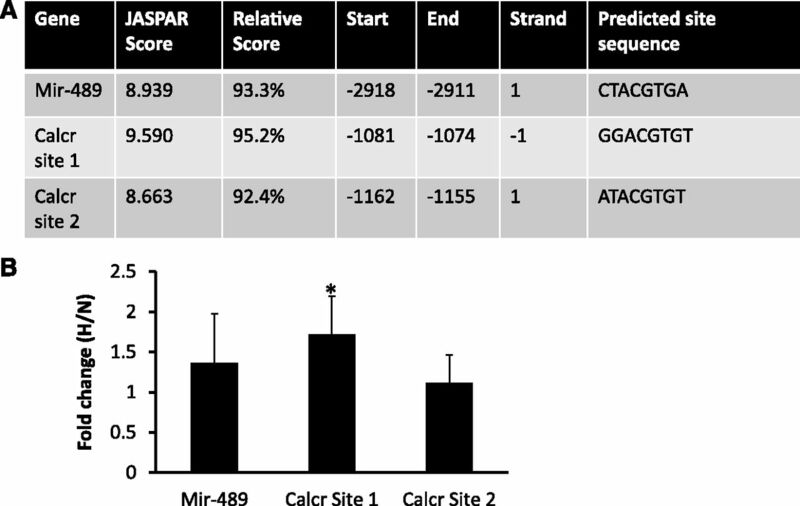 By its genomic location, miR-489 seems to be an intronic gene of Calcr. Together, these in vitro and in vivo studies support a role of HIF-1 in miR-489 induction during hypoxic/ischemic kidney injury. MiR-489 may be regulated directly by HIF-1 under these conditions. HIF-1 is known to be activated in ischemic AKI and has been reported to play a regulatory role in the underlying pathogenesis.32,38,39 However, it remains unclear as to which HIF-1–regulated genes are critical to the regulation. In addition to the classic genes that facilitate oxygen delivery, angiogenesis, and anaerobic metabolism or glycolysis,31,33 recent studies have documented HIF-1 regulation of miRs, such as miR-210, miR-21, miR-29, and miR-127.25,40–42 This study has further shown miR-489 induction via HIF-1. Importantly, by using anti–miR-489, we have shown a protective role of miR-489 in renal tubular cells, which may contribute to HIF-1–mediated regulation of ischemic AKI and kidney injury in general. The anti–miR-489 used in our study is in the form of LNA, in which the ribose ring is locked by a methylene bridge connecting the 2′ O atom and the 4′ C atom. This modification stabilizes the binding of LNA to its target miR to achieve an optimal inhibition. Sequence-based LNAs have been used recently to determine the function of specific miRs in vivo, including the kidneys.23,43 LNA–mediated miR inhibition may have long-lasting effects.44 In our study, LNAs were delivered intravenously, and the effect on other organs cannot be excluded. However, structurally, anti-miR LNAs are oligonucleotides, which specifically accumulate in the kidney tubular cells along with the liver.45,46 We further verified that the anti–miR-489 LNA targeted kidney tissues by showing the suppression of miR-489 in kidney tissues (Figure 6B). Functionally, anti–miR-489 LNA increased apoptosis after ATP depletion (Figure 4). Moreover, it enhanced ischemic AKI in mice. These injury enhancing effects of anti–miR-489 support a protective role of miR-489 in hypoxic/ischemic injury. How does miR-489 protect cells and tissues? The key to answering this question is the identification of target genes of miR-489. It is understood that miRs mainly function by binding to the 3′-UTR of mRNAs of their target genes, resulting in the formation of RISC to inhibit mRNA translation. In this study, we performed RISC IP followed by RNA-seq to analyze the targets of miR-489. This method has remarkable merits for miR target identification.47 Specifically, the association of RNAs to RISC induced by a specific miR is a reliable indication of direct targeting of the RNAs by this miR. In addition, it generates unbiased information of the global target profile of the miR. By using this method, we identified 417 mRNAs that were recruited to RISC by miR-489. Additional bioinformatics analysis of these mRNAs indicated that 127 of them contain miR-489–targeting seed sequence in their 3′-UTR. On the basis of these observations, we propose that the genes of these 127 mRNAs are the targets of miR-489. In the 127 target genes of miR-489, 18 are stress response related. These genes are of particular interest to this study, because they may account for the observed protective effect of miR-489. Among the 18 stress-responsive genes, we verified PARP1 as one of the miR-489 targets (Figure 10), and the protective effect of miR-489 to renal cell apoptosis is associated with the reduction of PARP1 level (Figures 5 and 10C). PARP1 is a well documented substrate of caspases, and its cleavage is considered as a biochemical hallmark of apoptosis. Petrilli et al.48 further showed that noncleavable PARP1 knock–in mice were resistant to ischemic AKI, suggesting a pathogenic role of PARP1 cleavage. Moreover, a role of PARP1 in ischemic AKI has been shown by studies using pharmacologic PARP1 inhibitors and gene knockout models.49–51 PARP1 activation may accelerate ATP depletion, induce DNA damage, and inhibit glycolysis to induce tubular cell injury and death.49–51 In light of these findings, our results suggest that miR-489 may protect against ischemic AKI at least partly by suppressing PARP1 expression. Nonetheless, several other target genes may also mediate the effect of miR-489. For example, NFAM1 can activate the expression of inflammatory cytokine TNF-α,52,53 which has been implicated in ischemic AKI.54 In addition, DNAJC3 encodes the procell death protein P58, which is involved in endothelium reticulum stresses,55 a potential pathogenic response in ischemic AKI.56 By suppressing these genes, miR-489 may directly promote cell survival in injured kidneys. In addition, several targets of miR-489 are proinflammatory genes, such as CXCL2 and CXCL10. Therefore, miR-489 may also block the expression of these genes, resulting in a suppression of inflammation and inflammatory tissue damage. In conclusion, this study has shown the induction of miR-489 during ischemic AKI and hypoxic incubation of kidney cells. miR-489 induction under these conditions is mediated by HIF-1. After being induced, miR-489 protects kidney cells and tissues against injury. The protective effect of miR-489 may involve the 129 target genes identified in this study, especially the 18 cell stress–related genes, including PARP1. RISC IP was performed according to that in previous studies,57–59 with some modifications. HEK293T cells were seeded in 100-mm dishes and cotransfected with 10 μg FLAG-Ago-2 plasmid (Addgene, Cambridge, MA) or control plasmid (p3xFLAG-Myc-CMV-24 Expression Vector; Sigma-Aldrich, St. Louis, MO) and 100 nM scramble RNA oligos or hsa-miR-668 mimic (Dharmacon Research, Inc., Pittsburgh, PA). After 48 hours, cells were used for either total RNA extraction as described above or RISC IP. For RISC IP, cells were lysed in 800 μl lysis buffer (150 mM KCl, 25 mM Tris-HCl, pH 7.4, 5 mM EDTA, and 0.5% NP-40 with freshly added 5 mM dithiothreitol, 1:1000 proteinase cocktail, and 100 U/ml SUPERase; Life Technologies, Grand Island, NY) for 30 minutes at 4°C. The cell lysates were centrifuged for 20 minutes at 14,000×g at 4°C to collect the supernatant, which was further filtered through a 0.45-μm syringe filter. Anti–FLAG-resin (Sigma-Aldrich) was equilibrated according to the manufacturer’s instruction in lysis buffer, mixed with the collected cell lysate at the ratio of 300 μl resin to 800 μl lysate, and then incubated at 4°C for 4 hours with rotation. The resin beads were then washed twice with 10× volume lysis buffer for 5 minutes each. At the last wash, about 5% beads were saved to elute proteins with SDS lysis buffer for immunoblotting. The other beads were suspended in 600 μl RNA lysis buffer from the miRVana miRNA Isolation Kit for RNA extraction according to the manufacturer’s instruction. Three sets of RNA samples from HEK293 cells with or without RISC IP were subjected to RNA-seq as described previously.60 Briefly, mRNA (cDNA) libraries were built with 5 μg RNA followed by cluster generation and sequencing. The RNA-seq data were analyzed by an in-house pipeline, which included reads mapping and alignment, transcript construction, quantification of transcript abundance, and identification of differential expression using Bowtie (http://bowtie-bio.sourceforge.net/index.shtml), Tophat v2 (http://tophat.cbcb.umd.edu/), and Cufflinks (http://cufflinks.cbcb.umd.edu/). Differential expression of transcripts was identified using false discover rate <0.05. The mRNA reads that showed a more than twofold increase in the hsa-miR-489 group compared with the negative control group in the precipitated RNA samples were considered to be potential miR-489 binding mRNAs. BUMPT cells with or without 6 hours of hypoxia treatment were fixed with 0.75% formaldehyde and then neutralized with glycine. Then, the cells were collected in cold PBS and pelleted with 1000×g centrifugation for 5 minutes at 4°C. The cell pellet was resuspended and lysed in the sonication buffer (5 mM HEPES, pH 7.9, 140 mM NaCl, 1 mM EDTA, 1% Triton X-100, 0.1% Na-deoxycholate, and 0.1% SDS) for 10 minutes at 4°C, and then, it was sonicated for 15 seconds each six times to shear the DNA. After centrifugation at 8000×g for 30 seconds at 4°C, the chromatin samples were collected from the supernatant; 50-μl aliquots of the chromatin samples were used for INPUT DNA extraction. After incubation with 1 μl 1 mg/ml RNase A (Qiagen, Valencia, CA) at 65°C overnight, the INPUT DNA was extracted with the QIAquick PCR Purification Kit (Qiagen). According to the DNA concentration of the INPUT samples, the chromatin samples were diluted with sonication buffer to 1 or 2 μg/ml DNA and incubated at 4°C with 1 mg/ml BSA and 40 μl protein A agarose beads (Santa Cruz Biotechnology, Santa Cruz, CA), which were prebalanced with sperm DNA and BSA in 1 ml reaction buffer. After 2 hours of incubation, the beads were removed by centrifugation, and 4 μg anti–HIF-1α antibody was added to the reaction for overnight incubation. Finally, the antibody was precipitated with protein A agarose bead. After serial washes in sonication buffer, buffer A (50 mM HEPES, pH 7.9, 500 mM NaCl, 1 mM EDTA, 1% Triton X-100, 0.1% Na-deoxycholate, and 0.1% SDS), buffer B (20 mM Tris-HCl, pH 8.0, 1 mM EDTA, 250 mM LiCl, 0.5% NP-40, and 0.5% Na-deoxycholate), and TE buffer, the DNA was eluted with 50 mM Tris-HCl, pH 8.0, 1 mM EDTA, 1% SDS, and 50 mM NaHCO3. The eluted DNA was purified with the QIAquick PCR Purification Kit after RNase A treatment. The precipitated DNA samples were quantified by real-time PCR with INPUT DNA for normalization. The following primers were used for HIF-1 binding sites detection: miR-489 F: CAA GAG GTT CCA GAC ATA CAT AGA T; miR-489 R: GCC ATA TAG CCT AGC AGT CTT AC; calcr site 1 F: CTT GGG CAT CCC ACA GTA TT; calcr site 1 R: GTG TAC AAC TCC GTG GCT TTA; calcr site 2 F: CGG AGT TGT ACA CGA CTT AGA TAA A; calcr site 2 R: GCC TAT GCT TAC ACC ACA CA; VEGF F: CCC ACC TCA CAA ACA CAC TAC; and VEGF R: GGT GTG CAT AAT GTA GTC ACT AGG. The 3′-UTR of the mouse PARP1 gene was synthesized (Genescript, Piscataway, NJ) and inserted into the 3′-UTR of the luciferase gene of the pMIR-REPORT Luciferase plasmid (Life Technologies). The plasmids with or without the insert were cotransfected with pMIR-REPORT β-gal Control Plasmid (Life Technologies) and 200 nM miR mimics (negative control versus mmu-miR-489 mimics; Life Technologies) into HEK293 cells. One day after the transfection, the lysate was collected in reporter lysis buffer from the Luciferase Assay System (Promega, Madison, WI). The luciferase activity was measured by the Luciferase Assay System, and the β-galactosidase activity was measured by the β-Galactosidase Enzyme Assay System (Promega). The luciferase activity was normalized with β-galactosidase activity. The luciferase ratio between mmu-miR-489 and control empty vector was considered as one, and the ratio of the pMIR-REPORT Luciferase plasmid to the PARP1 3′-UTR insert was compared with evaluate the inhibitory effect of mmu-miR-489. Mice were perfuse fixed with 4% paraformaldehyde, and the kidney samples were further fixed overnight at 4°C. After balanced in 20% sucrose in PBS overnight at 4°C, the kidney samples were frozen embedded for 7-μm cryosections. The fresh cryosections were dried for 20 seconds in air and fixed in 4% paraformaldehyde for 20 minutes at room temperature. After three PBS washes, the specimens were treated with 1 μg/ml proteinase K for 10 minutes followed with a PBS rinse. Then, miR-489 was detected with the IsHyb In Situ Hybridization Kit (Biochain Institute, Inc., Newwark, CA) following the manufacturer’s instruction. Briefly, the slides were incubated with prehybridization solution at 70°C for 3 hours. The hybridization mixture was then prepared by mixing digoxigenin–labeled LNA probe and hybridization solution to detect mmu-miR-489 (Exiqon, Inc., Woburn, MA). The hybridization mixture was heated at 65°C for 5 minutes and cooled on ice. After overnight hybridization with the hybridization mixture at 65°C, the specimens were washed with serial dilutions of SSC buffer and incubated with antidigoxigenin alkaline phosphatase–conjugated antibody. The final signal was detected by NBT/BCIP solution and analyzed by light microscopy. Animal and cell models, RNA extraction, immunoblotting, immunohistochemical and immunofluorescence staining, caspase activity measurement, and data analyses are described in Supplemental Material. This study was supported by National Natural Science Foundation of China grants 81430017 and 81370791, American Heart Association grant 12SDG8270002, National Institutes of Health grants 2R01DK058831 and 1R01DK087843, and Department of Veterans Administration grant 5I01BX000319. This article contains supplemental material online at http://jasn.asnjournals.org/lookup/suppl/doi:10.1681/ASN.2015080870/-/DCSupplemental.